As a coxswain, you're responsible for getting your boat to the start and ensuring it meets the requirements for safety, weight and condition. One of the least-known elements of racing for novice coxswains is boat weigh­ ins. Every boat class has a specified minimum weight. 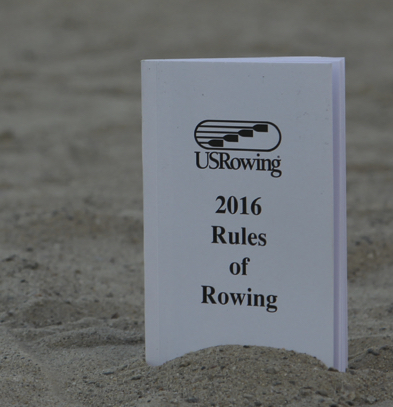 Get to know the rules about boat construction before you cox your next race. Knowing the Rules of Rowing will put you in the top-tier of coxswains who take their responsibilities to heart. We spoke with Tim Edsel/ at the 2016 Club National Championship regatta in Ohio. Tim has coxed at the club, collegiate, Masters and national levels, including three World Masters Regattas and the USA's LTAMix4+ at the 2009 World Championships. He's the creator of Cox'n School, an online resource for coxswains to develop their knowledge of coxing skills (www.coxnschool.com). Tim has been a referee for USRowing since 2009. "We weigh boats after the races, randomly selecting one, two or three of the top-three finishing places. It's as simple as this: in an A-Finals (Grand Finals) race, if your boat is under it's weight spec, you'll be excluded from the race. [If you're in a heat, the penalty is relegation.] That means your crew would have to give up any medals they may have won. This morning, a boat from Vesper-a men's quad-was under their boat weight after they had won the race. Unfortunately, they had to be excluded from the race. After that, we had a rush of boats that did test weigh-ins to make sure they were the right weight before getting on the course. Not every regatta has active boat weigh-ins, but the coxswain should find out at each regatta if boats are being weighed. It usually happens at the Club and Youth National Championships, but I've seen it at other regattas, too. I don't think most coxswains have been given the responsibility-from their coaches-of really knowing that their boat is theirs, that it's their responsibility. When you get to a regatta, check your boat. Don't wait for Control Commission. Believe me, I've seen boats in Control Commission without seats and without heel ties. The coxswain should take pride in their boat. Part of that is knowing its weight. Making sure your boat is ready to race is part of the leadership reins coxswains have to take. Check your seats, check every bolt, check your shoes. Get your bow number, and make sure your boat is the right weight. If a boat is underweight, additional weight can be attached to the boat-usually done with tape-to bring the boat up to its minimum weight requirement. This weight must be present in the boat during the race and during the post-race weigh-in. If boat weigh-ins are happening at a regatta you're coxing at, take the time to do a test weigh-in. We welcome it. We want the racing to be fair. This isn't a sport for the faint-hearted, as we all know, but boat weight isn't where you get your advantage. You get that by having your act together as a cox." These minimum weights include seats, rudders, skegs, fins, riggers, speakers, wiring harnesses, firmly­ affixed housings for electronics, cables and wires for the electronic equipment, and attached seat pads. The minimum boat weight does not include oars, bow numbers, or any other items that are not firmly fastened to the boat.